Epic Holdings plans a five-story mixed-use building on a plot of land at Fourth Street and Center Avenue purchased from the city. Dubbed Bolig Square, it is projected to include two main-floor commercial units plus 40 apartments with underground parking. A new downtown Moorhead landmark is one step closer to being realized after the City Council approved the sale of an odd-shaped parcel of land to developer Epic Holdings of Fargo at its regular meeting Monday. At the same time, they okayed the first property tax incentives awarded under the city’s new Renaissance Zone program to enhance downtown development. 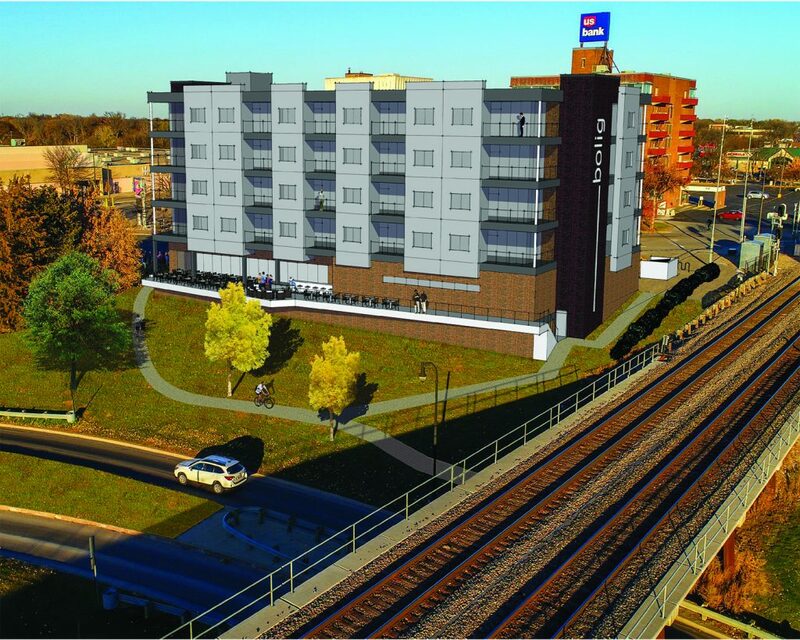 Called Bolig Square – “bolig” is the Norwegian word for “residence” – the project will be built on a now-empty southwest corner of Center Avenue and Fourth Street, is a five-story mixed use structure that will overlook the river. The concept includes two commercial spaces on the ground and 40 apartments on upper floors, along with underground parking. The company has also developed The Loft, another mixed-use building at the corner of Main Avenue and Eighth Street. In addition to approving the land sale for a purchase price of $200,000, the council approved the highest level of tax incentives available under the Renaissance plan. Derrick LaPoint of Downtown Moorhead, Inc., reported construction costs of more than $8 million qualify its owners for a three-tiered break on property taxes – 100 percent for the first five years, 75 percent for years six through ten, and 50 percent for years eleven through fifteen. The sale is contingent on the city receiving clear title to the land it purchased in the 1970s from BNSF railroad. Brian Kounovsky of Epic told council members that if all goes as expected, construction will begin this spring and be completed in 2020. The council also approved a property tax break for a second construction project in the city, this one located just north of the Azool Shopping Center at 815 37th Ave. S. Tony Paul of Goldmark Real Estates, on behalf of 815 Partners, requested the incentives for a 10,000-square-foot single-story structure. The $1.4 million building’s main tenant will be The Village Family Services. About 20 percent of the building will be available for a second tenant. The project will receive a five-year incentive under the citywide commercial and industrial program. Sale of a small parcel of city-owned land on Main Avenue was also okayed by the council. The 25-by-90-foot area, which has been used for parking by the Dorothy Day Food Pantry, was purchased by Harold’s on Main, a newly opened lounge, for outdoor seating and events. Moorhead Police Chief Shannon Monroe introduced four newly appointed officers to the council. City manager Chris Volkers noted that this marks the first time in many years that the department is at full staff. The new MPD members include officers Adam Jensen, Amanda Mohs, Kyle Huewe and Joshua Kleckner. He also presented veteran members who have received promotions in recent months: Sgts. Joel Voxland, Christopher Martin and Joseph Brannan , Capt. Deric Swenson, and Deputy Chief Tory Jacobson. Council members ultimately upheld the decision to deny renewal of a massage therapist license Season Relaxation Spa, 1606 30th Ave. S. Owner Qin Gong appealed the decision earlier this year, which followed an eight-month investigation by the Moorhead Police Department. Chief Monroe reported that when Gong submitted an application to renew her license to the city clerk, it originally indicated that two employees worked for her at that location. Investigation revealed that neither was licensed as a massage therapist; at that point Gong denied she had any employees at that location. However, two detectives posing as clients visited the spa, where they were offered the services of Gong and a second, unlicensed therapist. The police chief also noted the department has received reports of suspicious activity from neighboring businesses, though those accounts have not been confirmed. Moorhead’s city code establishes that no licenses or permits may be approved if the conduct is “contrary to the health, safety or welfare of the public,” and that no person will be licensed if the applicant has misrepresented or falsified information on an application. The council voted unanimously to deny Gong’s appeal. It was noted, however, that she may still reapply after a period of time to be determined by the city attorney.